Once again, Kanpur Development Authority has launched one of its biggest housing schemes. This time the authority invites applications for the allotment of 3800 flats in three different housing schemes under Samajwadi Awas Yojana 2016. 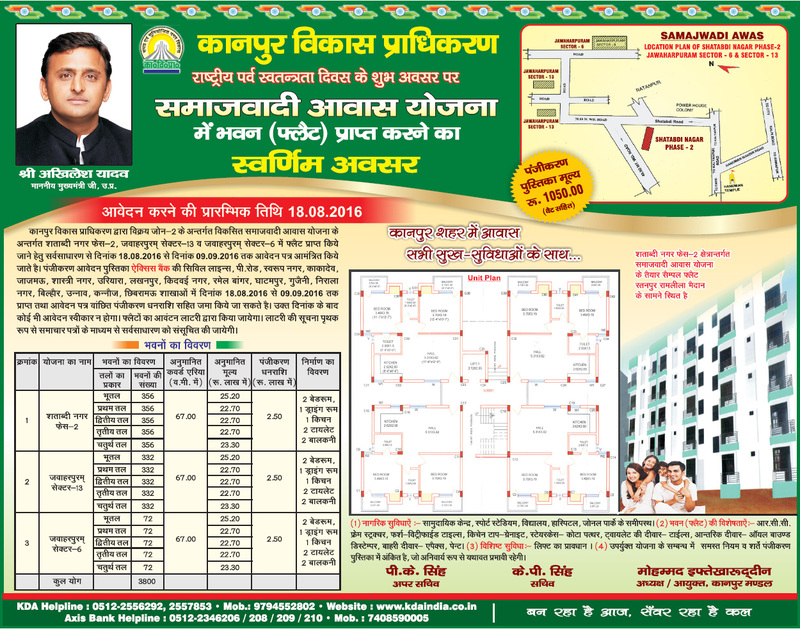 These are the new housing schemes of KDA Kanpur located at Shatabadi Nagar Phase-II, Jawaharpuram Sector-13 and Sector-6. All three scheme comprised on 2BHK flats having a covered area of around 67.00 square meter. KDA Shatabadi Nagar Phase-2 scheme offering of 1780 flats while KDA Jawaharpuram Sector-13 and Sector-6 offering 1660 flat and 360 flats respectively. Registrations for flats in the scheme has been started from 18 August 2016 and the last date of applications submission is 9 September 2016. Brochure along with application form can be obtained from the authorized bank branches Axis Bank by paying the cost within the registration period from 18 August to 9 September 2016. Completely filled application form to be submitted in the same bank branches along with the registration amount of Rs. 2.50 lakh.